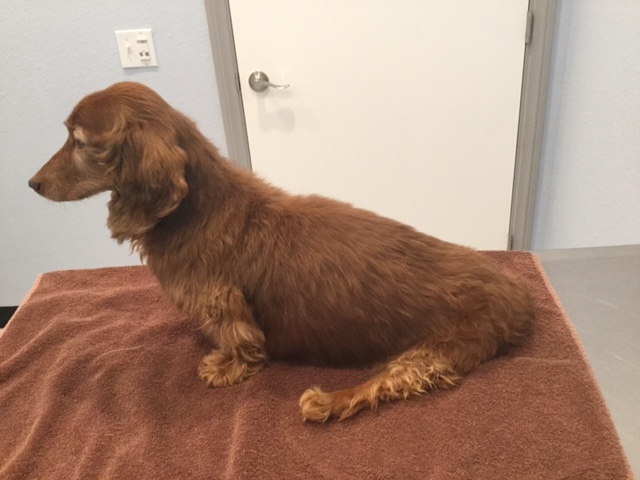 Abstract: “Twerp” is a 13-year-old Neutered Male Dachshund that presented for acute lower motor neurondisease and paralysis in the lower rear limbs. He was having difficulty standing, trouble with urination and defecation. He received three weekly treatments of electro acupuncture, dry needling, and therapeutic laser which improved his motor function. Twerp presented for inappetence, ataxia, severe conscious proprioceptive deficits, difficulty urinating, defecating and acute paralysis of the lower limbs. Three years ago, he had thoracolumbar intervertebral disc disease. There was no prior history of surgery or trauma. On 5/18/2017, he weighed 7.3 kilograms, his heart rate was 100, and he was slightly tachypneic on examination due to suspected pain or anxiety. His abdomen was tense upon physical examination which I suspected at the time it was due to referred pain from his spinal disease. The rest of his physical examination was within normal limits. Twerp was ataxic and his legs were flaccid and he was knuckling his rear paws. All his cranial nerves appeared normal. His thoracic limb reflexes appeared normal upon examination. His pelvic limb reflexes were severely abnormal. He had severe conscious proprioceptive deficits. I tested his rear limb reflexes, he had an exaggerated patellar reflex on both hind limbs. He had no evidence of crossed extensor reflex. Based off his physical examination Twerp has Grade 4 spinal cord disease. After I performed his neurological examination, I performed a myofascial examination, he appeared very tight and had myofascial bands in the upper cervical region. His spinal muscles appeared very tender and he had a panniculus response when I started lightly palpating around T11-L2 region. His spinal muscles had taut bands in the L3-L5 region. Differential Diagnosis: Intervertebral Disc Disease was my first primary rule out because he was non-weight bearing, had hind limb paralysis, and conscious proprioceptive deficits. He had a history of a possible disc issue in the past three years ago although it was not confirmed on MRI. Other thoughts were FCE or hemorrhagic stroke in his spinal cord. Definitive Diagnosis: Intervertebral Disc Disease (Lower motor neuron disease) L3-L7. The patient exhibited signs of Lower motor neuron disease (flaccid paralysis, CP deficits, and non-weight bearing). I utilized three acupuncture treatments using electro acupuncture (mixed 4Hz/100Hz for 10 min) on BL 23- BL25 and dry needling using Seirin (0.16 and 0.20 x 0.30 mm needles). I used GV 20, GV 14, ST-36, and Bai-hui to stimulate the parasympathetic nervous system. He had significant sympathetic tone from his intervertebral disc disease and anxiety. I believed these points would be beneficial for his first treatment to help his body relax and heal. ST-36 is an excellent acupuncture point for pelvic limb dysfunction due to crosstalk with other peripheral nerves and other spinal segments. Bai Hui is also another point used for lumbosacral pain and neurological dysfunction because it can communicate with regional spinal segments and alleviate any tender trigger points in this area. I also utilized Bafeng to stimulate the digital nerves in his hind feet to reflex loop into the spinal cord segments to promote nerve health and healing. I also used BL 19 and 21 because I felt extreme tension and myofascial tenderness at this region from his previous IVDD. In addition to acupuncture I used gentle massage on his spinal column in the thoracic region, lumbar region his hind legs all the way to his digits. I also utilized therapeutic laser on his spinal column (thoracic and lumbar vertebrae) to increase cAMP and increase the speed of healing of his nerves and nerve axons. Through photo biomodulation, laser allows the muscles to heal and relax which is beneficial in spinal cord injury. He also received gentle physical massage and aqua therapy to strengthen his supporting muscles. “Twerp” improved significantly in his three acupuncture sessions. He suffered from a significant spinal cord injury and improved to a spinal cord injury grade 2 by the end of his third treatment. The effectiveness of acupuncture is unclear in SCI, but it is a safe long term option with very few side effects (1) The use of veterinary medical acupuncture can avoid the consistent use of prednisone or non-steroidal anti-inflammatories which can cause gastrointestinal bleeding and renal dysfunction. (2) It appears that with acupuncture there is strong analgesic effects with little to no side effects which make its clinical use vital to the treatment of spinal cord injury. There appears to be an increased quality of life with the use of veterinary acupuncture with minimal side effects (3). I learned that acupuncture is an integral component for pain management and vital for the treatment of spinal cord injury. I would want to see a randomized controlled study evaluating the differences between integrative treatments (i.e. acupuncture/electric stimulation/rehabilitation) and recovery times from decompressive surgery. I believe that acupuncture and the use of other modalities (rehab/laser) may avoid euthanasia or costly, painful surgery. In Heo, Byung-Cheul Shin, Young-Dae Kim, Eui Hyoung Hwang, et. al Acupuncture for Spinal Cord Injury and it’s Complications: A systematic Review and Meta Analysis of Randomized Controlled Trials Evidenced Based and Alternative medicine Volume 2018, Article ID 364216, 18 pages.